Posted on February 27, 2014 February 6, 2015 . by Patrick Johnstone. 2 Comments. 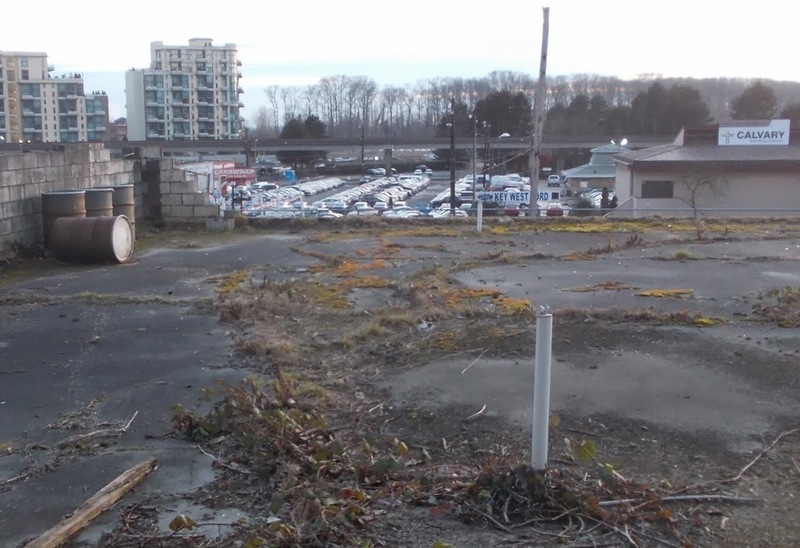 There is one site in New Westminster that seems to come and go from the public eye and conversation, but never seems to go anywhere. 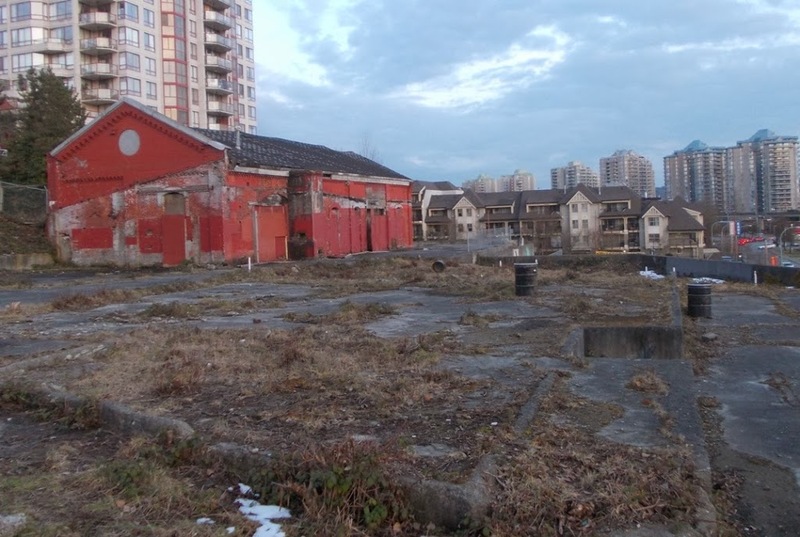 The empty lot with the decrepit red brick building at the corner of Third Ave and Twelfth Street: the “Gas Works Site”. The conversation popped up on Twitter this week, and got me back to thinking about it. The last time I had a conversation about the site it was with a business operator in the area who asked over a beer why the City wouldn’t let him park used cars on the site. It made sense to him: the City could get a little revenue from it, and it sure beats the hell out of having it sit there empty and ugly. I started to explain to him the myriad of technical and legislative reasons why the City couldn’t just let him do that, and his eyes soon glazed over, he dismissed my points as “Hogwash”, and we went back to talking about curling. I love this town. So here is a fuller explanation, best I can figure, and call it hogwash if you like. But first, I need to throw one of my disclaimers out there, in case there is an actual hog being washed. Everything I know about the Gas Works Site comes from the City’s published documents, most of which you can read here. I have no insider knowledge, nor have I talked to the City to find out if there are unpublished or updated plans for the site. Also, I work with contaminated sites in my professional life, so I know a lot about their technical reality and their legislative challenges, but my knowledge about this particular site is limited to the City’s released reports. Nothing following this should be construed to be professional advice, just informed opinion. The former costs money; the latter is always free! Gas Works were once common in North American and European cities. These were facilities where coal or coal tar was converted to “town gas”: a mix of methane, carbon monoxide, hydrogen and various other vapours. The gas was then piped all over town to provide gas for streetlamps and some domestic cooking and heating. This was before the technology of pulling methane out of the ground for the same purpose was developed. The gassification process in the 19th Century also produced a fair pile of by-products, come useful, some not. At the time, there was a general practice of dumping whatever waste you may have wherever it could percolate into the ground and go away, presumably forever (the word “pollution” probably was only applied in the biblical sense at the time). As a result, these sites commonly have soil and groundwater impacted with a variety of persistent and ugly contaminants – from rather unpleasant monocyclic hydrocarbons like benzene and xylenes through to a nasty collection of polycyclic aromatic hydrocarbons and things like phenols, heavy metals, and cyanide. At the New Westminster Gas Works site, some of these substances persist in the ground even 100 years later. The site is big-C “Contaminated”, and not in the biblical sense. 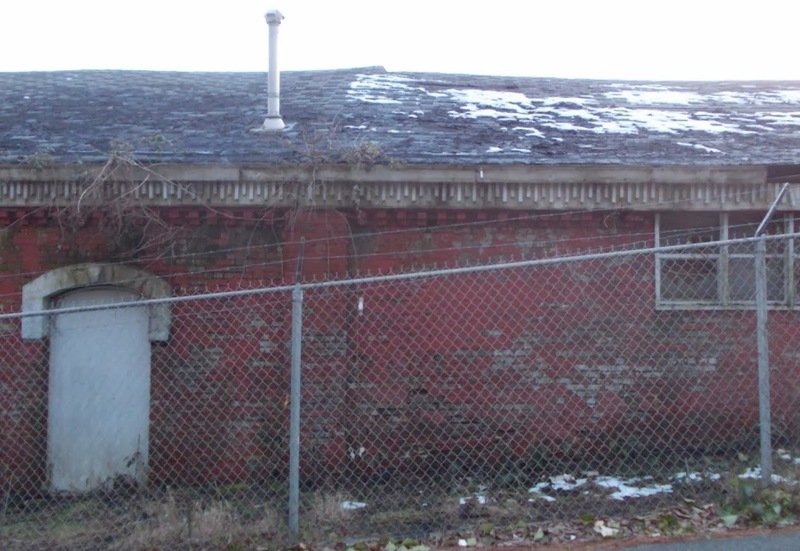 The building on the site also happens to be one of (if not “the”) oldest extant industrial buildings in New Westminster. It is a bit of an architectural treasure, as long as it is still standing. Problem is, the building is standing on top of contaminated soils that will be hard to remove with a building standing on them. 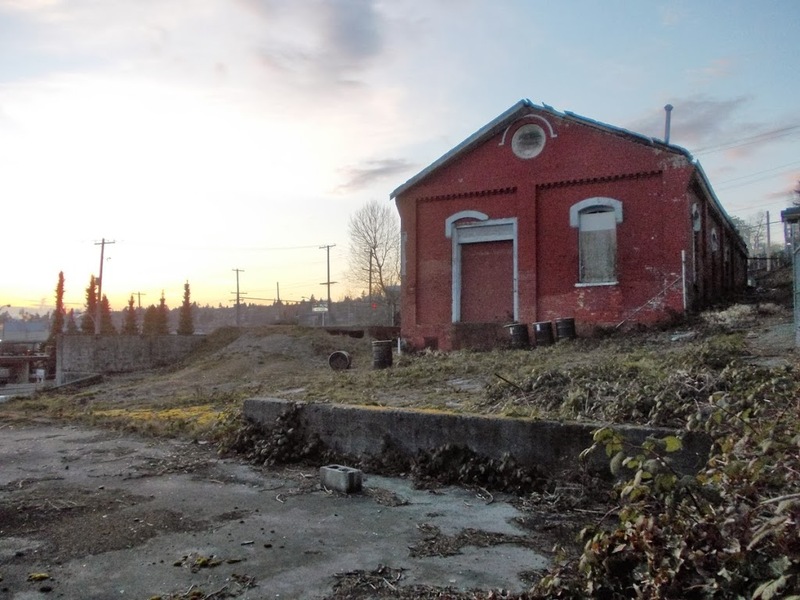 If the City wants to do something useful with the site, it first has to clean it up, and before they can do that, they need to decide how to deal with the building. The site does not currently belong to the City. As the business that operated the Gas Works is long gone, this is a technically an abandoned contaminated site. The BC Environmental Management Act makes the Province responsible for cleaning up abandoned sites. However, like any other landowner, the Province is not compelled by the Act to clean it up any time soon, as long as no-one is currently being harmed by the contamination. The situation here is not unlike “white pipe farms” we find around British Columbia. The person who owns the land (in this case, the Province) is responsible for the contamination, and if anyone wants to develop the property, they need to deal with that first. The Province is unlikely to sell the land in its current state, because if they do so, they are still, under the Environmental Management Act, responsible for the liability caused by the contamination and are not permitted to sell that liability. Therefore, they are motivated to sit on it, because if anyone uses that land they may expose the owner to unanticipated liability (by doing something dumb like drilling a well into the contamination zone, or starting a day care in the basement exposing the kids to toxic vapours). Notably, because the City owns the road, if it was really concerned about the contamination under 12th Street, they could go out there tomorrow, dig it up and send the Province the bill. If the Province didn’t want to pay, they could drag it out in the courts for years, but none of this is a very nice way to interact when it is much easier to just make a deal. Apparently the Province was interested in 2009 in getting this site off its books, and the City was interested in making it happen. According to the City reports, there was an initial agreement or MOU signed between the City and the Province for the City to take over the site with some conditions that the City not sell it for commercial use or market housing, yet the affordable housing component that would have been included in market housing for the site be accommodated elsewhere in the City. This conditions was, it would appear, not an issue for the City. Therefore the City went through a Land Use study and public consultation process back in 2009, to determine the community interest in the use of the site. It seems that some combination of a new Firehall, a park, and a community amenity building (or even community gardens!) was the preferred direction. From what I can glean from the available reports, a deal was outlined where the City would receive the land as a free crown grant (yes, for free!) from the Province (conditional on it being used for public, not commercial, purposes) and the Province would pay for the cleanup of the site. Remember, the Province is already responsible for this cost, but this deal would have just caused them to take this action sooner, rather than sitting indefinitely on the site. The Province suggested complete remediation of the site (i.e. digging up and trucking away the contaminated soils and treatment of groundwater if required). The details had yet to be worked out how the excavation under the building would occur, but the lowest-cost and lowest-risk alternative seemed to be inserting a sub-foundation under it to support portions of the building while excavation takes place. The contamination has also spread under 12th Street, and the Province proposed to “Risk Assess” that. This is a common technique for managing low-concentration stable contamination, similar to the way the “toxic blob” at the Pier Park was managed: you isolate the contaminant, make sure it cannot reach humans, plants or animals in a way that might harm them, then monitor it over time to assure conditions under the ground don’t change. There is a good reason for doing this in a location like 12th Street, as there is a big water main and other utilities under the ground there, and if the contamination is located a few metres below those utilities, it will be remarkably complicated (and therefore expensive) to try to dig it out without damaging that infrastructure. From the report, it appeared the City requested that the Province to do a full remediation under the road, but it is not reported if the Province agreed to this and the increased cost. If the Province really wants to remove the liability related to those contaminants and not be stuck with long-term monitoring costs and potential hassles, this would be a reasonable approach for a piece of land (the road) that they do not own. So that was 2009; where are we now? The City and the Province apparently still have some deal-making to do. To remediate and dispose of the land will cost the Province up to $2 Million. This cost will depend on how they decide to deal with the heritage building on site, how they plan to deal with the contamination in the road, and what the final land use plan is (community gardens or institutional buildings may require different remediation standards than open park space, at different cost). Once this work is done, the City will be stuck with a large, highly disturbed gravel lot with a dilapidated building on it. To realize the dreams brought up during the Land Use Study and public open houses will cost hundreds of thousands or even millions of dollars, all of which will have to be raised by the City. Currently, the site is surrounded by used car lots and a church – not huge tax revenue drivers for the City. However that church is currently looking at an ambitious redevelopment, and there are bigger dreams for the longer-term development of the Lower 12th commercial area. Where does this particular Park/Amenity project fit on the priority list for the City? 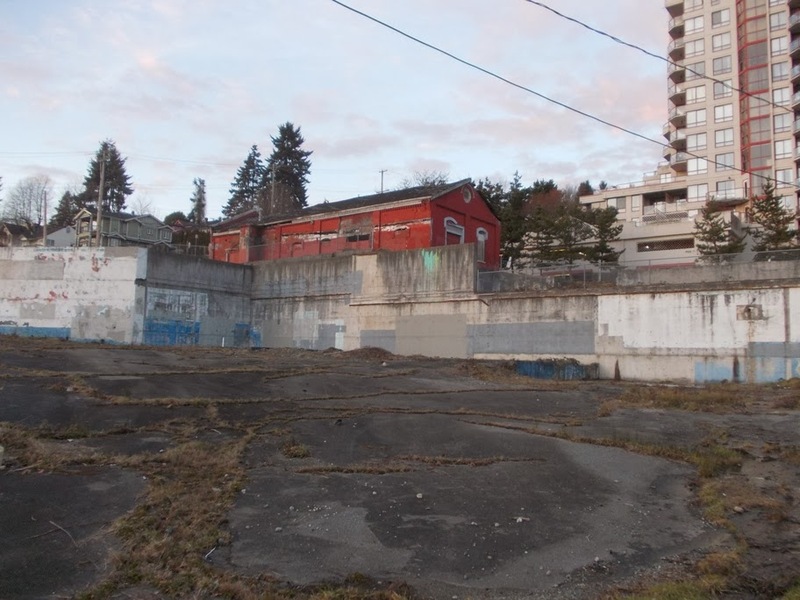 How engaged is the Province in the plan to remediate this site? When will something finally happen to the Gas Works? The only thing I know for sure is that the old brick heritage building in the middle of it is not getting any younger. The flashing is failing, and there are gaping holes in the wood roof. I hope that the parties can come up with a plan before the “what to do with the building” problem is solved for them by gravity and rot. Posted on February 19, 2014 February 6, 2015 . by Patrick Johnstone. 1 Comment. This has me perplexed, and disappointed. This is perplexing, because it is so very wrong, and threatens the integrity of the consultation process that has been taking place for the last two years. The last round of consultations took place in June of 2013, and TransLink brought to our communities a list of 25 options, ranging from complete removal of the bridge to a myriad of refurbishment, twinning, replacement, and relocation options. 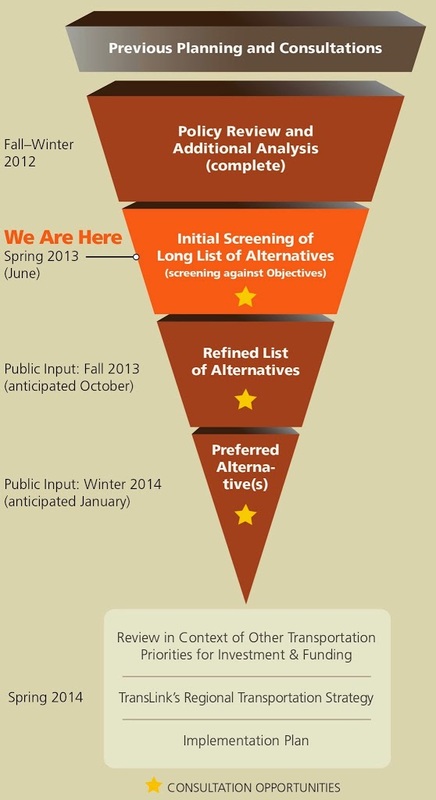 They had already “shortlisted” 6 options as meeting their declared objectives and warranting more discussion. They were sent back to their Sapperton Offices with comments (including some strong opinions that a few of the “not-recommended” options might require some re-consideration), presumably to apply some engineering and costing to the options to further evaluate their suitability. At the time, they promised to be back in New Westminster in October 2013 with a refined list of alternatives, and for a preferred alternative to be offered in January 2014. We are still waiting for that first meeting. Delays happen, I recognize. Some of the delay may be the fault of New Westminster asking for more time to work within the Master Transportation Planning framework, the group has sought further input from Coquitlam about alternate locations, and TransLink has been, for lack of a better word, distracted of late. See the pointy bottom of that pyramid? That is where, after extensive study and consultation, the alternative that “best meets community and regional needs” has been determined. Right below it is the next step: “review in context of other transportation priorities for investment and funding”. That sounds an awful lot like reviewing “how options for this project will fit into the regional plan”, which is what we are now awaiting before consultation can come back to the City. Somehow, the Pyramid got mixed up. Gone: the rehabilitated 3-lane bridge, the rehabilitated 4-lane bridge, and the Coquitlam alternative. Remaining: a new 4 lane bridge in the same spot, a 5 lane bridge with the outside lanes connecting directly to the SFPR, and a 6 lane bridge with the outside lanes connected directly to the SFPR and including some local road widening in New West.There are rumours of an extremely unlikely tunnel under Royal Ave. The plans were completed enough that they were presented to the City of Surrey’s Transportation Committee this week and tweeted out by various participants. If we know the plans, if the detailed engineering analysis we have waited 7 months for has been done, if information has already been leaked out, if the rooms are already booked, why, at the 11th hour is TransLink changing the consultation game? How does this help the credibility of an organization that (in my opinion) does great work with limited resources but is suffering a bit in the public relations department right now, and has done and excellent job (after a rocky start) at making this consultation process public, open, accessible, and accountable? 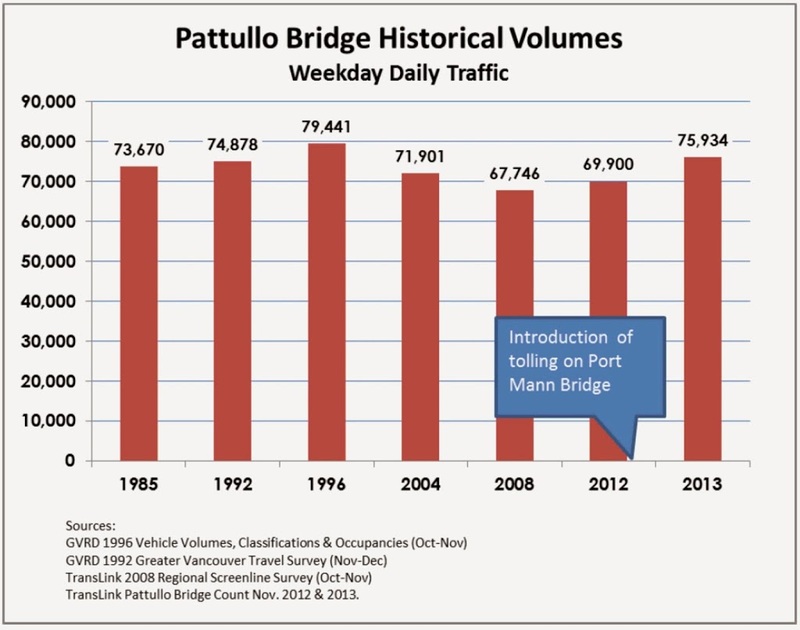 The future of the Pattullo Bridge is the single most important transportation issue in New Westminster today. Every other transportation issue from truck traffic overload to pedestrian safety is related to it. The Pattullo’s future will impact how and where our City will grow, and how we will apply our Master Transportation Plan to continue to develop one of the most “alternative-mode friendly” Cities in the region. Delaying these decisions does a disservice to the City TransLink now calls home. Posted on February 18, 2014 February 6, 2015 . by Patrick Johnstone. Leave a comment. I have been a little busy of late, sorry to be not updating this blog as often as I would like. It’s not like there aren’t many things going on, just too many to write about them in full! I do want to make mention of the well-attended (even crowded) Open House last week at City Hall. The topic was proposed changes to the City’s truck routes maps. This comes on the heels of two related media storms. Well, media dust devils at least. First was the release of preliminary traffic count data that shows a spike in vehicle traffic through New Westminster concomitant with the tolling of the Port Mann Bridge. That this is happening was a surprise to no-one who lives or works in New Westminster, but the Ministry of Transportation at first suggested it was just our imagination. Then the Minister suggested that increased traffic was a result of a boom in the economy. This lead to the unintentionally hilarious suggestion that New Westminster’s economy must have grown by 10% over the last year, for the increase of traffic we are seeing. That the Ministry of Transportation finds it surprising that people are avoiding tolls should concern all of us. Not only does this reflect the findings of transportation engineers world-wide, the same Ministry of Transportation went so far as to install signs instructing people on the best way to avoid tolls, and have established a policy that assures toll avoidance will always be an option. The second part of this story is the increased voice of individual people in New Westminster who are being impacted by this increase in traffic- especially the impact of increased commercial truck traffic. A Facebook campaign called “Rattled about Traffic” has grown out of Queens Park, and the topic of the increased traffic is being discussed at the Queens Park, Brow of the Hill, Massey Victory Heights, Downtown and Glenbrooke North Residents’ Association meetings over the previous month. Always a little punchy about traffic (being a City inundated by vehicles that have no origin or destination here), New West is once again getting loud about the issue. The overall-traffic-volume half of this equation is going to come up during Pattullo Bridge consultations starting next week, but I want to address today’s pressing issue: the open house that hoped to address the too-many-trucks side of the equation. The changes proposed by the City are very modest. 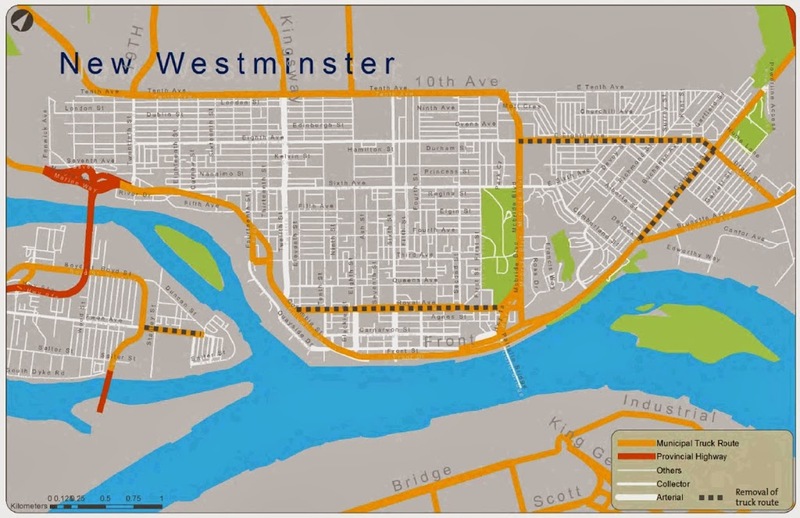 They comprise the removal of truck route designation from three stretches that are currently only truck routes between 7am and 9pm): the length of Royal Avenue; East Columbia Street through Sapperton; 8th Avenue between East Columbia and Braid; and an appendix-like extension at the east end of Ewen Ave in Queensborough. The other truck routes around the periphery of the City will remain intact. dotted lines are the routes proposed for removal from the designation. The biggest effect of these changes is not visible on the map, but will be in truck access to the Pattullo Bridge. East-bound vehicles from Stewardson will simply no longer be able to access the Pattullo. These vehicles will now be required to use the Queensborough Bridge (presuming, of course, that they didn’t come from there) and the Alex Fraser to access the new South Fraser Perimeter Road to get to the Bridgeview area of Surrey (which was the rationale for building the SFPR in the first place). Alternately, trucks from Marine Drive can access the Pattullo by using Southridge Drive, 10th Avenue, and McBride, although modeling and surveys by the City suggest this would not become the preferred route. Vehicles arriving westbound from Highway 1 or Lougheed would only be able to access the Pattullo via Columbia and the loop in Albert Crescent Park. That loop is currently closed during rush hour due to congestion and safety issues where it merges with traffic on the north foot of the Pattullo (although the City has agreed to work with TransLink to address this issue). This connection could be avoided by sending the eastbound trucks to Front Street and the Queensborough, and westbound trucks to the Port Mann (a connection made much easier if, as Councilor Puchmayr is apt to point out, the Ministry had thought to connect the SFPR to the Port Mann). Similarly, trucks entering the City from the Pattullo will be limited to travelling north on McBride or turning east on Columbia. They would need to use an alternate route to get to Marine Drive east of New Westminster: the SFPR-Alex Fraser-Queensbrorough route, or the McBride-10th Ave-Southridge Drive Route. Note this important point: these changes will make no difference to anyone delivering or picking up goods in New Westminster: the proverbial “head of lettuce in Safeway” that the trucking industry always talks about. Trucks having legitimate business in New Westminster have always, and will continue to, use non-truck routes like 6th Street and 12th Street, and will continue to be able to use Royal Ave to bring your lettuce to one of the 17 Save-on-Foods outlets planned for New Westminster. For a similar reason the changes on Ewen Ave. will make no difference to anyone, as that vestigial truck route isn’t a “through route” to anywhere, but just provides access to a few businesses from Derwent Way. Overall, this looks good. It reduces the impact on the Sapperton business district, and improves safety and livability on residential portions of 8th Ave and Royal. It should also reduce the incentive for some truckers to use to the Pattullo in an effort to avoid tolls, sticking more of them on the SFPR or the expanded Highway 1 where they should be. If you support these changes, it is important that you let City Council know. THIS WEEK. There is a reason they are gauging public support at this time. The process to remove trucks routes is a bit complicated, the City can’t just go out there and slap up some signs. They have to apply to TransLink to have the designation removed. Since TransLink is charged with the responsibility of regional goods movement, they have a say on what is and is not a Truck Route. In exchange for allowing truck routes on City owned streets, TransLink provides road maintenance funding through the “Major Road Network”. This $100 Million expense is one of those things TransLink does that few seem to notice when all this talk of a “Transit Referendum” takes place. So when the City goes to TransLink to explain why Truck Route designation should be removed from these routes, as minor as they are, they will need to provide a rationale, expressions of public support, and some detailed modelling of the impact on the entire transportation network. It isn’t a slam dunk, so the City could use a healthy amount of feedback from the citizens impacted by these routes to bolster their case. You have to Friday to go to the City site and provide your feedback to the City. You can do it all on-line. Then go Here and fill out the survey. Posted on February 13, 2014 February 6, 2015 . by Patrick Johnstone. 2 Comments. It is clear the failure here is on the province, trying force a referendum where one should never be, not the Mayors’ Council or TransLink for seeking clarity about how this alleged referendum will work, and the consequences of its failure. It is important to note that TransLink, the Mayors’ Council, and indeed Municipal governments, exist at the pleasure of the provincial government. Saying “no” is not an option the Mayors have. The Minister is within his rights to introduce these legislative changes, and the Mayors need to do what they are told, or they will be in violation of that legislation. That’s the reality of being the third level of government. However, this is not a legislative debate at this point; it is an argument about governance. The Minister has not done his job, which is to administer the Transportation System of the Province for the good of all British Columbians, including the 60% that live in the TransLink catchment. He is new to government, and arguably his Boss gave him an impossible task with an idea she sketched on a beer coaster. So now he has a Transportation Problem without a palatable solution. That creates a different kind of problem: a Political Problem. With this letter, we have to question which problem the Minister is trying to solve. Is he even interested in finding a solution to the region’s Transportation Problem? In reading that letter, one might surmise that he has given up on that task, or (worse) it was never the problem his Boss charged him with fixing. After all, they have referendum-free tunnel/bridge replacements to build. Instead, all the Minister’s thought and action seems directed at the Political Problem. Tell the mayors to solve the referendum fiasco for him, put them on a tight deadline, issue a few threats, cut their purse strings and remove any possible way for them to demonstrate creativity on leveraging funds. If they don’t get it done, you can kick the entire issue down the road for 3 or 4 more years, and call it their failure. Hopefully everyone will forget you failed first. It is brilliant in its cynicism. This guy isn’t a Minister of Transportation, he’s the pointy-haired boss from Dilbert, as drawn by Machiavelli! The mayors are being set up to fail, and as such, they are unlikely to find a solution that works here. The best they can hope is to change the conversation. The message they need to send back has to be clear, unified and public. They need to demand that the province stop putting up roadblocks and issuing threats, and they need to start working collaboratively towards solutions. They need to point out that the province needs to work with them to do this because it is in the province’s best interest that the region has a robust, affordable, accessible and effective public transportation system. And because that is Todd Stone’s job. Option #1: We invest something in the order of several hundred million dollars a year on large and small scale expansion, and get back to building a world-class public transportation system envisioned in Transport 2040, and beyond. We can fuss later about chosen technologies (Light and Heavy Rail, Rapid Bus, 99-Line style medium bus, and regular bus, gondolas, HandyDarts, whatever works and makes the most economic sense to solve a local transportation problem). Before we have that debate, we need to know what the funds available are and when they can be delivered, as that will ultimately decide on the technology and priorities. We need this funded in 5- and 10-year commitments, so that longer-term growth can be properly planned for: no more random build-what-some-minister-wants pet projects that set us back a decade (I’m talking to you, FalconGates). I don’t know the number, but $220 Million per year is probably the right order of magnitude. I pick that number out of the air because that is equal to 1% of the Provincial taxation revenue. We can raise taxes 1%, or the 1% that is easy to find through belt-tightening according to Grandpa Cummins and some local municipal pundits. Option #2: We put no more money into TransLink, and we keep the transit we currently have, operating at full capacity. This is the feared “failed referendum” outcome. Of course, there will be 1 Million new residents moving to the Metro area over the next 30 years who will then lose any freedom to choose how they travel, and will be dependant on cars. Transit is full, there will be no more room for them. At the current car ownership rate, that’s 700,000 new cars. If you line those cars up, bumper-to-bumper, they will make a line more than 3,000km long. If moving, they will take up 4 or 5 times this distance. To accommodate these cars, the Province will need to double or triple the number of lanes on all Provincial Highways (Hwy 91, Hwy 99, Hwy 1, Hwy 17, etc.) and concomitantly to build more expensive new crossings of all of our watercourses. The local roads budgets for all of our municipalities will similarly rise, as will healthcare costs, police and fire costs, and our greenhouse gas emission. To deal with these cars when they are not moving, we will need to build 2 Million new parking spaces in increasingly congested and expensive real estate. So this option will “save” us a couple of hundred million dollars per year, but preliminary conservative estimates suggest this savings will come at the cost of ten times that amount. To quote the Minister- there is only one taxpayer. Option #3: We do neither. We let the transportation system we have today limp into the next generation, and make only the most modest changes that we can afford without raising anyone’s taxes. This will no doubt kill our growth projections, as our livability will disappear and the economy will stall. Even at half the projected growth, we will still be stuck with almost 350,000 new cars on the road. Then we will learn what real traffic congestion looks like. Now that AirCare is being deep-sixed, our air quality will worsen, and the entire region will become less affordable and less livable. Your commute times will double or triple, it will restrict the Port’s dreams of doubling the number of containers they plan to move. Cities will struggle to keep up with road repairs as the load on them increases. It will make every business and the entire region less competitive in the global market. It will kill jobs, re-draw our landscape, and transform Greater Vancouver into a something we will no longer recognize, mostly because we will no longer be able to see the mountains. Imagine Mexico City with worse weather. Actually, that’s not fair, because Mexico City is investing the rapid transit at a rate that would make Todd Stone blush. Which brings me to the Billion Dollar Question. If the mayors are indeed responsible for putting together the question for a referendum they don’t want, what should it look like? One of the Minister’s primary talking points through this entire escapade is “Making sure that traffic congestion is reduced to improve your daily commute is important to our economy and maintaining this region’s great quality of life.” Let’s take the Minister at his word, and assume from this that Option #3 above is not an option the Minster can abide. So the referendum question is really between the first two options. We cannot have a “none of the above” option, as much as Premier McSparkles™ likes the idea. The option of not funding transit improvement hurts the livability of our region, and does not achieve our Regional Growth Strategy, Transportation Plan, Greenhouse Gas Reduction, or Goods Movement goals. More importantly, the option of not funding transit expansion throughout the region is a very bad deal for the Province and the taxpayers. The Minister of Transportation can repeat the messaging that this the Mayors’ problem now, or repeat how the Province will not contribute because the Province will not ever raise your taxes. However, it is the Ministry of Transportation that will have to pay for the major freeway and bridge building projects that will be required to move the extra 700,000 cars through out region by 2045 if the million people joining our region are not given the choice of using more sustainable modes. Those are your taxes. 1: Transit Expansion! (1% increase in your taxes, buy your own Compass Card). 2: Freeways and Bridges for all! (10% increases in your taxes, buy your own car). 3: Doom! (free, but you can’t have this). That should effectively demonstrate what a foolish idea this referendum really is. Posted on February 10, 2014 February 6, 2015 . by Patrick Johnstone. Leave a comment. Less than 24 hours after I wrote this piece on the ongoing fiasco that is the Transportation Referendum*, the Minister of Transportation threw a great big wrench into the already significantly muddled works. Unfortunately, instead of providing helpful guidance during a time of confusion, he brought down a little monetary blackmail, told the Mayors to do his work and make a choice, then took away most of the choices the Mayors may have had. This was not a good day for the Mayors, the Minister, or the region. It was a 4-page letter, so I cannot address it all here, and much of it was a repeat of talking points with which the Mayors should already be very depressingly familiar (“ensure traffic congestion is reduced to improve everyone’s commute”… ugh). That said, there was enough new stuff offered that is worth discussing in detail. This is an interesting piece of rhetoric. That “some of the members” have suggested this is to downplay the entire Mayors Council spoke nearly unanimously on this topic, and their opinion was supported by TransLink management, the business community, organized labour, the media from left and right, and every transportation and regional planning expert asked. The only people who thought this was a good idea were the Premier, Jordan Bateman, and Lois Jackson: A dangerous combination on the best of days. It also seems to absolve the Minister of any responsibility for having done absolutely nothing to make the Referendum a possibility in November 2014. This referendum was announced by his Boss in a fit of pre-election scrambling, and the election that made the vapid promise “policy” occurred a full human gestation ago. What has the Ministry done in this time to set the parameters for the referendum? Where is the question? Where are the policy ideas? Where is the public discourse on the topic of transportation options? After squandering those 9 months doing nothing, the Minister is now tasking the Mayors’ Council with drawing up a Referendum that they don’t want within 4 months, off the sides of their desks while they already have full-time jobs running their damn cities. Translated: If they don’t do within the next 4 months what he hasn’t accomplished in the last 9 months, they won’t see a lick of new money until 2017 or 2018, and they will have to not only run the referendum they don’t want, they will have to pay for running it! Really? Slowly, now: Then. Why. Have. A. Referendum? So the rest of the province will not pay anything to support the movement of people or good in the Lower Mainland. Because we all know people in the rest of the province don’t use roads or transit in Vancouver, and no goods moving through this region support businesses or people in the rest of the province? Bullocks. 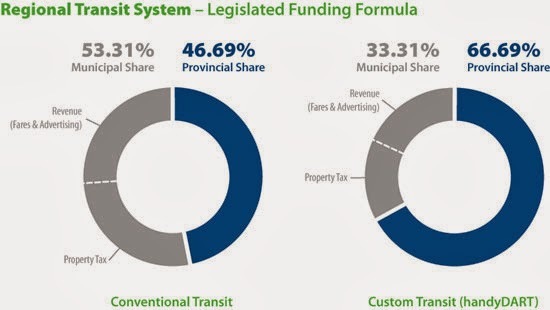 As an aside, see this graph that shows how BC Transit is funded. This is the agency that provides public transportation everywhere outside of the TransLink catchment, including transit servicing Todd Stone’s new office in Victoria and his home in Kamloops (not that he would ever use these, of course). So the Lower Mainland is able to pay into general revenue that funds half of the BC Transit System, but none of the rest of the Province is expected to pay one red penny to support TransLink. Can we at least vote on that? So that, in one short sentence, does it for any creative new ideas that have proven to work elsewhere and serve Transportation Demand Management purposes as well as revenue generation. No tolling of all the major crossings, for a dollar or ten, and absolutely no regional road pricing. Note both of these decisions were made without the benefit of a Referendum and without consulting those local leaders he so trusted to create a clear vision. To the Minister’s benefit, there is some potential good news in this letter around a return of some TransLink governance powers to the Mayors. It is too early to tell what the Minister really means by the changes he mentions obliquely – does this mean the Mayor’s rubber stamp will now just precede the non-elected Board’s approval instead of following it, or that they will actually have new or restored power? Until some draft legislation is sketched up and the Mayors can get a grip on it, no-one can say except Todd Stone. However, looking at the list of responsibilities the Minister is giving the Mayors (“approval of fare adjustments… oversight of customer satisfaction…sale of major assets…establishing remuneration of TransLink’s Executive”) it seems that the Mayors are being passed a satchel full of political hand grenades without knowing if any still have pins in them. The question now is how do the Mayors react to this significant shuffling of the deck? I will talk about that in my next post…. *This entire mess is not helped by the uncertain language being used around this referendum on transportation funding for the region. The colloquial in the media has been to call it either a “Transit Referendum” or a “TransLink Referendum”. In fact, the Minister himself used the latter term in his Editorial last week, although all of his subsequent discussion was about “reducing congestion for commuters”. I have been chewing on this, and have decided “Transportation Referendum”” is the fairest term. It is being foisted upon TransLink and the region by the Minister of Transportation, and the decision we are making here is not merely the future of TransLink, it is the future of the region’s transportation infrastructure. Posted on February 8, 2014 February 6, 2015 . by Patrick Johnstone. Leave a comment. I haven’t yet waded into James Crosty’s most recent public tantrum, mostly because it at first seemed so absurd at the face of it, and because I had no personal stake in the issue (except as a consumer living near Uptown and generally being interested in improving our community). Then a few letters arrived in the local paper and the topic keeps coming up in conversations around town and on Twitter. So, as opinions are starting to fly, I may as well add mine. First off: a caveat. I like James. I think of him as a friend, despite all of our on-line bickering. I have continued to argue to people that, despite James’ loose association with facts and woe-filled prognostications of the future of New Westminster, he means well, and only wants what is best for his City and neighbours. However, at times like this, I find it a difficult argument to support. Crosty appears angry that some other businesses in town have worked together to form a not-for-profit business association, and further propose to develop a BIA that would work towards neighbourhood beautification, special events, and promotion of businesses in Uptown. He appears to be upset he was not invited to their meetings, despite his business not being within the catchment area. His non-invitation appears, to Crosty, to be an indication that something unseemly is going on. Yet his lack of inclusion concerns him less than the spectre of his potential forced inclusion! I think the organizers of the BIA do a better job addressing Crosty’s concerns regarding the history and model of the BIA proposal than I could. As his business is not within the Uptown area, there was no reason for them to seek his approval prior to registering their Association any more than there was any reason to seek mine or Don Cherry’s. Regardless, as a concerned citizen, if he has concerns about their organization, wouldn’t it have been more effective to, I dunno, ask them? He also raises a lot of questions about how the BIA would be financed, and what the money would be used for. Most of those details were included in the Council Report that started this all. Some of his other questions are addressed in the Uptown Business Association response, and others are likely details that have yet to be worked out, if the proposal receives the support of the affected businesses and the City. That most of the questions Crosty raises are answered or easily answerable, combined with the fact that his business is not impacted by this proposal, leads one to ask what exactly is his beef here? In our Twitter exchanges, Crosty commonly chides me for not doing enough to try to connect the dots and find out what’s “really happening” behind the scenes. I’m not very good at conspiracy theories, but let me try my hand at “connecting the dots” here. The Uptown BIA idea is being coordinated and organized by many of the same people who organized the massively popular Uptown Live event for the last two years. Uptown Live was associated with the Hyack Festival, though much like the Anvil Battery Salute, the May Day Celebrations, and other events you would associate with Hyack Festival, Uptown Live was not “run” by Hyack, but was “associated”. In the case of Uptown Live this means they shared some promotional materials, and coordinated some common timing of events so as to “share the crowd”. Hyack did not organize the event itself, nor did they pay for the event. This is not to lessen their role, coordinating events run by many different groups into one great week is something Hyack does well – many hands make lighter work, and Hyack is good at getting those many hands together. However, one of the central figures in organizing Uptown Live was none other than Bart Slotman, whose company runs Westminster Centre. He (along with a team of Uptown folks) put a significant amount of time, energy, and resources into organizing and pulling off Uptown Live for two successful years, and had a vested interest in its continued success. When the Hyack situation hit the fan last year with the firing of Douglas Smith and acrimonious rift of the Board, the organizers of Uptown Live saw the potential that this could hurt what they spent two years building, and wisely protected the intellectual capital they had created. To one of the sides in the Hyack rift, this was seen as a public betrayal, and Bart Slotman joined the “rogue” Hyack members, the former ED of Hyack, and the Editor of the NewsLeader in the increasing pile of “enemies of Hyack”. Therefore, he was singled out for personal attack in the media by various Hyack insiders, including James Crosty and his Partner. I want to emphasise this point. Slotman is a businessman in New Westminster who manages one of the larger commercial buildings in town. However, he is also a resident of this town, and I cannot think of commercial property owner in New Westminster (with the possible exception of Mark Shieh) who has done more to promote what is good about the City in the last few years. He has stepped up to sponsor events, he has served on committees. He has been present at open houses on various topics, and provided useful input. He has taken risks and spent his own money to improve the streetscape of the City lands in front of his building. He has been instrumental (pun!) in organizing UpTown Live and UpTown Unplugged. He is the model of what this City needs for its business areas to succeed – engaged resident owners who care about making their community better. Should all of this make him immune to criticism? Of course not. However, by putting Slotman’s name right there in the first grammatically-challenged sentence of his letter to the Editor, then naming him again several more times (including questioning his character with the phrases like “…by the likes of Mr. Slotman”), Crosty makes it clear that it is not necessarily the idea of a BIA that he opposes, but the idea of a BIA where Bart Slotman and “his like” are part of the organizing group. It smells of a personal vendetta, and that smell stinks. As for the follow-up letter from our resident Ayn Rand aficionado, there is no doubt this is a contrasting opinion to how and what a business is than the one demonstrated by Slotman. I’ll just say I’m glad we have effective BIAs and a Chamber that do so much to support the community, because I cannot imagine living in a City comprised only of business with the level of cynical disinterest expressed in this letter. Oh, and I am currently enjoying a bottle of Killer Cab, contributed by Pacific Breeze in to one of the many community events they sponsor. Another example of a positive, community-building business here in New Westminster that deserves our support. Posted on February 5, 2014 February 6, 2015 . by Patrick Johnstone. Leave a comment. I haven’t written too much about the proposed TransLink Referendum. Yeah, I mentioned last year what a terrible idea it was, but it has come to the point where that is the consensus opinion outside of the Premier’s Office, so it seemed unnecessary a point to belabor. Then, last week, the Minister of Transportation circulated an “Editorial” (raising the question of just what he is the editor of) outlining the need for a referendum. It seems a strange thing to do right now, as he has been saying essentially the same thing since he got the job (even if he and his boss have consistently disagreed about the form of the referendum she promised back when he was still in the private sector), and it seems meaningless to spend time convincing us that we need something that he is already committed to delivering, whether we like it or not. What might have been more useful at this point in the discussion would be for the Minister to affirm that a successful referendum that sets a stable funding mechanism in place to build and operate a sustainable transportation system for the entire region is of utmost importance, and his #1 job this term, and he won’t let us down. That would be inspirational about now. Instead he demonstrates what a few people have suggested: the Minister from Kamloops simply does not understand the transportation needs of the Lower Mainland. The issue of transportation in Metro Vancouver is very topical, and that’s a good thing. Making sure that traffic congestion is reduced to improve your daily commute is important to our economy and maintaining this region’s great quality of life. You have got to be kidding me. The Minister thinks “making sure traffic congestion is reduced” is the #1 transportation issue in the Lower Mainland? This, after they just spent $5 Billion building and expanding freeways and the widest bridge in the world, and have already decided the next $2 Billion will not be up for referendum, but will be blown on yet another oversized bridge? He still thinks the priority is yet more roads and bridges? This opening paragraph, more than any below, demonstrates that Todd Stone has no idea what the hell is happening on Broadway, in Central Surrey, on the packed Canada Line, the increasingly unreliable Expo Line, on all those neighborhoods that are seeing their bus service cut, or on the traffic-clogged streets of New Westminster. But to improve transportation in Metro Vancouver, big decisions lie ahead. Decisions that the people who live, pay taxes, and commute in the region need to be a part of. Today, transportation improvements are supported through taxes and fees like property tax, gas tax, transit fares, and tolls for new crossings. And while there are many taxes, there is only one taxpayer—and that’s you. Ugh. Note that the Minister is talking about transportation improvements (but not the ones he has already promised, like the tunnel) and not about maintaining the transit service we currently have. While he bickers and dithers about how to pay for any imagined transportation improvements, bus routes are being cut, major pieces of infrastructure are failing, and our communities are becoming less livable because there isn’t even enough money to maintain the overcrowded transit system that we have. To support expanded transit and road networks for the region, many local government leaders have advocated for additional sources of funding to be created, on top of those taxes and fees you already pay. Ok, see what he is doing here? The Minister does not want to raise your taxes! He wants to make things better for you, but he doesn’t expect you to pay for it. He wants it to be free. It’s those evil spendthrift local governments though: they are the ones who want you to pay for it! Please, Mr. Minister, if we agree that improving transportation infrastructure is “important to our economy and maintaining this region’s great quality of life” as you suggest in paragraph 1, how will we fund the necessary “expanded transit and road networks” without increasing what people already pay? Further, if we agree it is important, can you assure us there won’t be a “none of the above” option on the referendum? Can you chat with your boss about that? The provincial government does not disagree with this idea. But our position is clear. If the people of Metro Vancouver are being asked to pay new taxes or fees, on top of those that local governments and TransLink already collect, then taxpayers must have a say. See, he did it again? No, not the starting a sentence with a conjunction (which he did do), but see how he pointed out the evil ones – it is local governments and TransLink that collect taxes and fees. It is almost as if the Province doesn’t collect any taxes or fees at all. How, exactly did we pay for those $5 Billion in freeways? This is why the provincial government is committed to a public, region-wide referendum. It’s a commitment we made in the last election and that citizens supported. We will deliver on that promise. But let’s not get ahead of ourselves. Asking people to vote on a new transportation vision comes after governments and citizens work together to clearly determine and articulate what that vision actually is. Please do. Because the only thing worse than this referendum idea is the stunning lack of leadership and vision from the Minister and the Premier on making this thing actually work. If you’re following the news, you’ll have heard about passionate and important transportation projects that individual local governments are behind. The job ahead is to bring this into a common vision. I’m not even sure what a passionate transportation project is, except maybe this? but you are starting to creep me out here, Todd. p.s. : The mayors are united in a common vision, just not the way you want them to be. And, I would argue, success depends on a vision that is affordable for taxpayers, fair for all communities, and secures the movement of people and goods for generations to come. (Again with the conjunctions). The worst part about this all, is that we have that vision. The region had a long term plan for a Livable Region supported by Transport 2040. It is the plan that TransLink has to keep cutting back on because of lack of funding, in part because they are stuck giving $30 Million a year to the operators of the Golden Ears Bridge because of a bad deal signed by the Minister of Transportation for a bridge that TransLink didn’t want, because of the $170 Million (so far) white elephant that are the FalconGates, and because of other short-sighted moves by the Provincial Government that would not allow that plan to be realized. I will continue to work with the mayors to facilitate and help enable a process to bring focus to the regional transportation vision, so that the people can decide what’s best. See, the Mayors are not interested, you screwed them enough times. You managed to do what no other Minister of the Provincial Government has done, and you have got all of the Mayors to be unanimous on a Transportation idea – the idea of killing the referendum. If you and the Mayors did, miraculously, come up with the ultimate vision, the grand plan that will solve all, then why the hell delay and go to referendum? What happens if that great plan fails at referendum? What is the back-up plan, here. Sir? If we work together for the benefit of the whole region, mindful of taxpayers big and small from Whalley to Whytecliff, Maple Ridge to Arbutus Drive, we will all succeed. Arbutus Drive!? Is Whistler in the referendum zone now? Look, Minister Stone, with all due respect and my sincere hopes that you succeed at setting a new, bold, plan in place for transportation in the region, I feel for you. I know you are new to the role, and your boss has given you an untenable task. Being a Minister means you are responsible for this file, it is time to step up and make the case. This letter didn’t do it. Read the writing on the Wall: everyone from Barbara Yaffe to Gordon Price to Vaughn Palmer is saying it is a bad idea. The Board of Trade and the major trade unions are agreed (!) that it is a bad idea. Every Mayor (except the one who just wants to destroy TransLink and replace it with a tunnel) and the management of TransLink are against it. The referendum is now only a distraction from the real conversation: how are we going to move the region forward? Time to stop editorializing, Mr. Minister, and time to start leading.